The group is a family owned concern, currently run by the third generation, with three production sites, one of which in Port-Gentil (Gabon), one in Saint-Jean-d’Angély and the third, which is the one we visited, in Eliots, north-east of Angoulême, where a Celaschi panel squaring line has been fully operational for a few years. Before it reaches the Celaschi line, the wood is transformed in plywood. “We retrieve the unfinished sections of poplar, which we cut lengthwise”, explains Laurent Marty, the Industrial Manager. “We then pass them through a short wood peeling lathe that can treat wood up to 2.7 metres in length [longer sections, up to 6 metres, are peeled at the Saint-Jean-d'Angély site, editor’s note]. They are then dried with a new system purchased in 2016, which is 30 metres long and 6.20 metres wide”. After the peeling, the poplar sheets are thoroughly checked. If any break, the strips are sent to the joining laboratory: “where they are processed to create intact sheets”, continues Laurent Marty. “In particular they are straightened and re-assembled with the application of a strip of glue”. Finally the set of sheets, in poplar or okoume, is glued and passed under the press to obtain plywood panels ready to be squared in the Celaschi line. 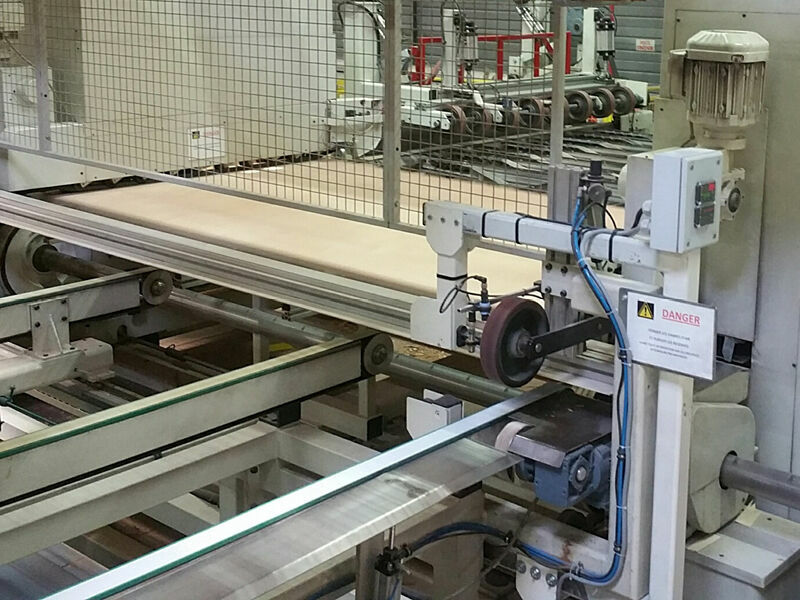 The Celaschi line, which became fully operational after only 3 months from delivery, is fitted with an automatic loading system and today operates in a shift. Equipped with specifically designed tools “it can machine 4000 panels per shift, with lengths which range from 2.15 metres (for doors) to 3.10 metres”. Moreover there is no need to change the tools when the type of wood changes. “Currently we use only two or three sets of tools per year, knowing that the machine does not vibrate and that it ensures that the pieces are held securely allowing for a high level of machining precision”. Once the dimensions have been programmed, the panels are cut along the longer side, whilst the scrap is unloaded laterally and milled. The panels are then transferred with feed pistons to ensure the squaring. “This custom transfer system has been developed thanks to a close collaboration between SCM and our design office”, explains Laurent Marty. 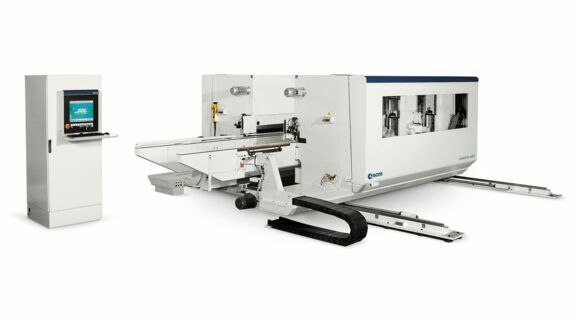 “Since the machine has been installed we are very happy with the machining results”. The second panel squaring line machines the short side and the scrap is collected and recycled as fuel for the boiler. The panels are then fully finished and ready to be shipped in France and worldwide. 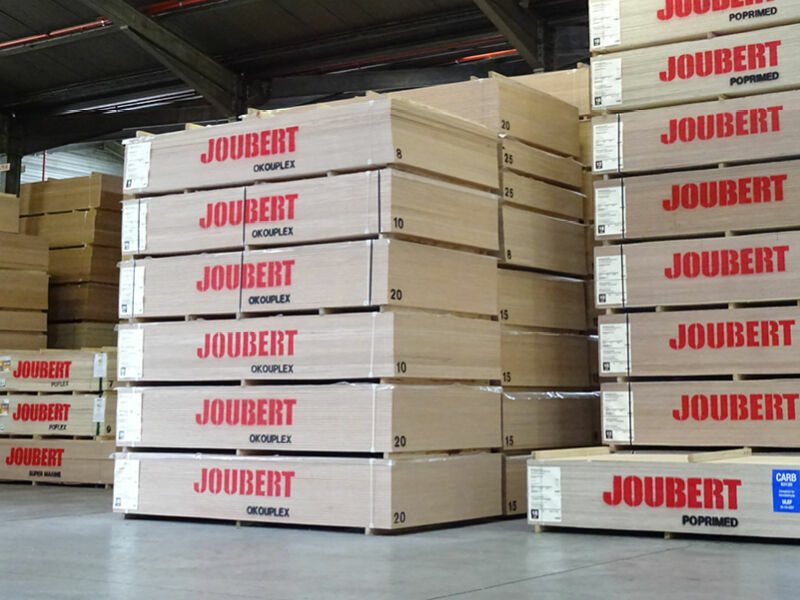 Joubert Plywood exports 70% of its production, in particular to the Netherlands, which is the group’s main market.